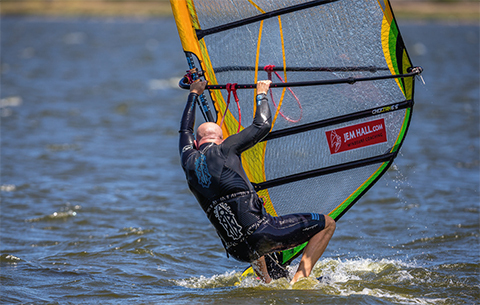 Waterstarts are key to windsurfing progress and a huge part of windsurfing for intermediates to advanced sailors alike – from learning this gateway move to getting up in 7 knots of wind in a wave break. They are an extension of our stance and our beach starts so great skills in these really can ignite our waterstarts. Many of the skills and actions required for waterstarts will also help you nail your footstraps and vice versa so it is worth attempting both these skills in a similar time frame to get the cross over technique dialled in; so recap by reading last month’s piece on footstraps if required. 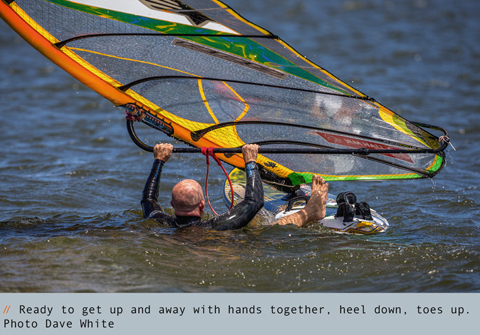 Be in the sweet spot, bend and extend and then come up slow, stay low and finish looking upwind. 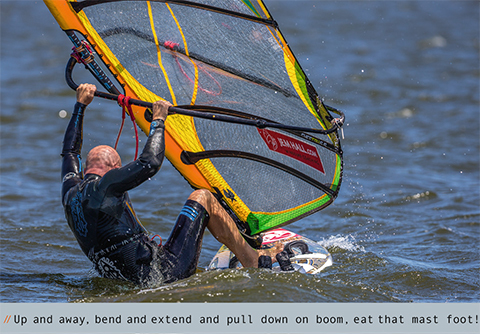 Extraordinary actions will produce extraordinary results, so from here on in,ensure when beach starting you exaggerate your key actions and control your board’s tail to not drift downwind as you beach start. Following on, in your stance, keep the rig away, get low and look where you wish to go. This piece will give you the tips to conquer and improve your waterstarts and also highlight the all-important 3 stages: rig recovery, board positioning and up and away. I will also suggest some key waterstart techniques advanced riders should have in their armoury. • Kneeling down and sailing along both ways. • Leg Drags both ways. Drop your front leg in the water and bend and extend, more on this later. • Leg drag beach starts both ways. Genius move for steering and downforce (mast foot pressure). • Carry sail efficiently to and from water. We must embrace working with the wind from the moment we are rigged up! • Flip the sail effectively and efficiently all the time. Again, we work with the wind. • Know the exact wind direction and your position relative to it. This aids all areas of your waterstarting. • Relax when clearing the rig and getting it up and away out of the water. The rig will clear and you will get up, even if you don’t manage it straight away. • T.C.U.P. Think clearly under pressure. • Lift the rig up and across to clear it and again work with the wind. • Look upwind when waiting. To keep control, assess your position and see gusts to help you get up in lighter airs. • Kick with the front leg in the water to propel you up and only place it on the board late so it acts as a daggerboard in order to stop you drifting. • Bend and extend; bend your back leg to pull the board in and extend your arms to catch the wind AND pull down on the boom. 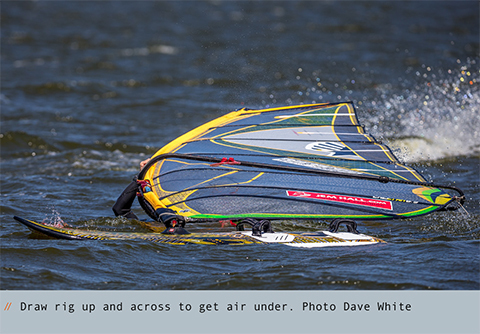 • Come up slow and stay low, you can actually plane out of a waterstart from this low position. 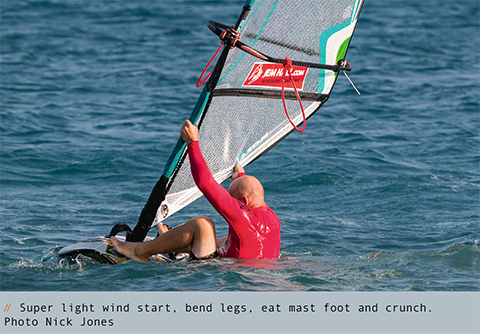 • Look upwind to spill wind after coming up, and avoid catapaults and reset for getting planing / moving. • Little and often or less is more. When learning this challenging and physical move hit it for no more than 20 minutes in chest depth water both ways. If it is not working in deep water then get on and uphaul after a few minutes. Let’s look at some tips to help ignite your waterstarts. This is how you get the rig out of the water, both for deep water and when out of your depth. Please note there are so many ways to clear it and too much to cover in depth here so for a more comprehensive guide check my DVD Beginner to Winner, and my top 100 Vimeo tips. With all your hard work in the earlier drills you are now ready to get the rig out of the water so here we go. • Again, check and know the wind direction. 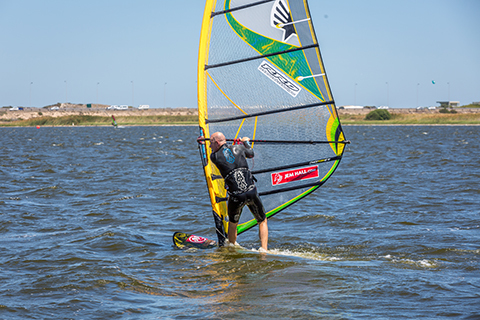 • Use the wind and your body in the most efficient way possible as it is technique and working with the wind, and not strength that clears the rig from the water. • With the mast across the wind this is perhaps the most common and easiest position to learn the rig recovery. Ensure you swim backwards to clear water from the rig and that you are at a right angle to the wind. • With 2 hands on the mast, above the boom, keep swimming and pull the mast across and over your head, like your bed sheet on a cold night. • You can also swim sideways towards the wind and with one hand (the back hand) on the mast throw the rig forward into your other hand. This is like throwing a javelin and uses stronger muscle groups in your body. 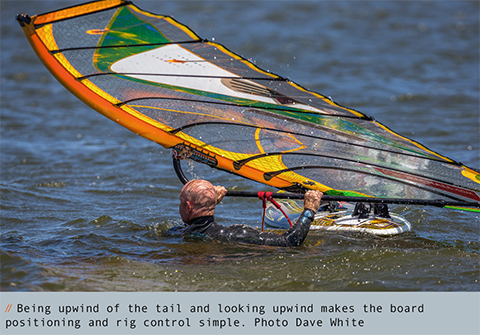 • With the rig downwind of the board you can clear it over the back of the board and so for this ensure you are upwind of the tail, and that you have your front hand on the mast and back hand on the tail as you pull the mast across and over you. • With the tip of the sail pointing into the wind swim to the head and then lift and shake the rig to clear it with the front hand as you swim backwards. You can then work down the mast to be ready to get your hands on the boom. 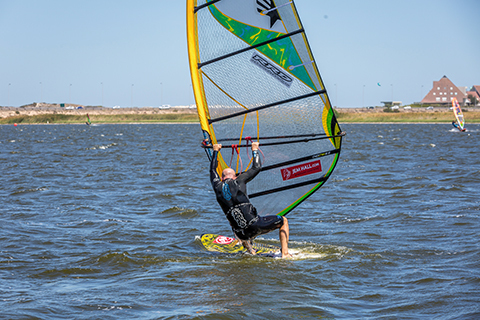 • It is important to note that after clearing the rig the back hand goes on the boom first as you look upwind and then move your body into a position upwind of the tail of the board from where you can steer and then position it. Now that you are a rig recovery master let’s put you into the ‘sweet spot’ to enable you to position the board correctly for getting up and away. The ‘sweet spot’ is upwind and towards the tail of the board where you can steer effectively, control the sail’s power and spot gusts. The position and steering technique is the same as for the beachstart. • For stronger winds the ‘sweet spot’ is more into the wind. 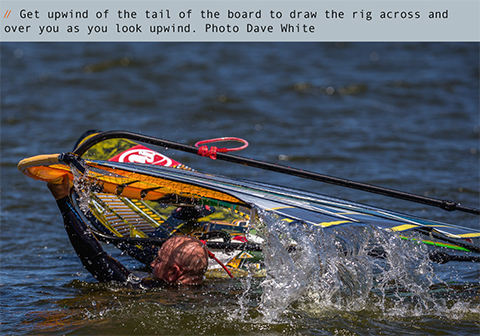 Rig gazing and heading downwind whilst waiting results in catapaults. Many of the skills and actions to get you up and away on to the board you will already have from brilliant beach starts and from all your hard work on drills previously highlighted. You will need to co-ordinate many actions at the same time so speed and explosion is very important. • From your sweet spot get your back foot on the board with your heel down/ toes up and positioned just upwind of the centre line between your footstraps. • Control your position and sail power with subtle steering and raising or lowering the rig. • Your front leg should be straight down in the water, as a daggerboard and to kick and propel you up! 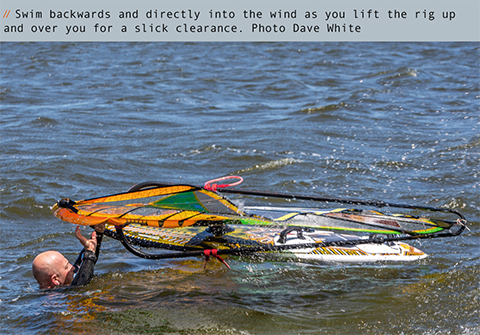 • Spot the wind and ensure you are across the wind or slightly upwind. • When ready to explode up and away, your back legs BEND as your arms EXTEND, after an initial twist (sheeting in) of the rig. • Your head should move forwards and in as you focus on ‘eating the mast foot’ which will only be possible with heaps of Bend and Extend. • Really pull back heel to your arse as you initially throw the rig up and then pull down on the boom (into the mastfoot) when the rig is fully upright. Kneel and leg drag drills ready you for this! • As you come up slow, stay low and then look upwind to spill the wind. Hoorah to you and keep at it and look to keep improving all areas of the waterstart. Mine are still getting better! Many of my wavesailors and advanced sailors still need plenty of tips to get better rig recoveries and actually get out of the water. • Flipped; when the board flips in the waves or after a tack then keep the rig flying and use your feet to flip the board as you come up. • Light wind; either place the front hand on the mast to get the rig more up right and powerful or the full power one hand on the mast and one on the foot for super light airs. Note: I can do this much better as my core is now stronger! • Clew first; a crucial waterstart for all levels.